The "Painted Ladies" are back in the Davis area. 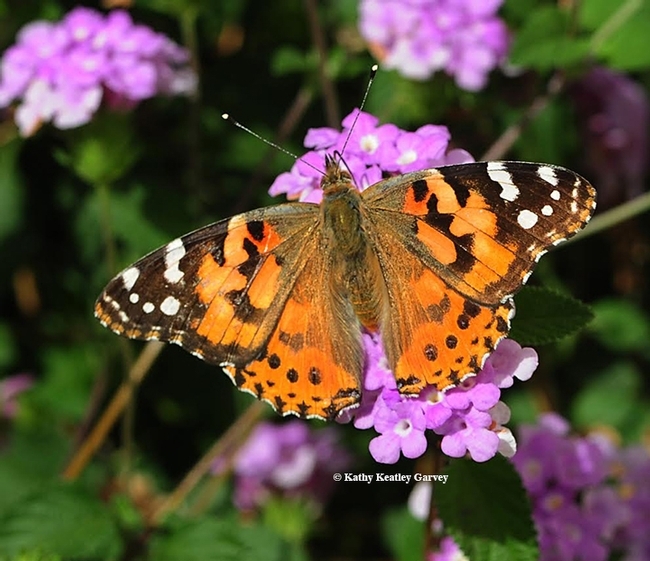 These are not the two-legged type, but the winged type--Vanessa cardui. They're migrating and driving UC Davis entomology and ecology students nuts. It's finals week and they'd love to be outdoors watching the migration instead of inside studying for their tests. 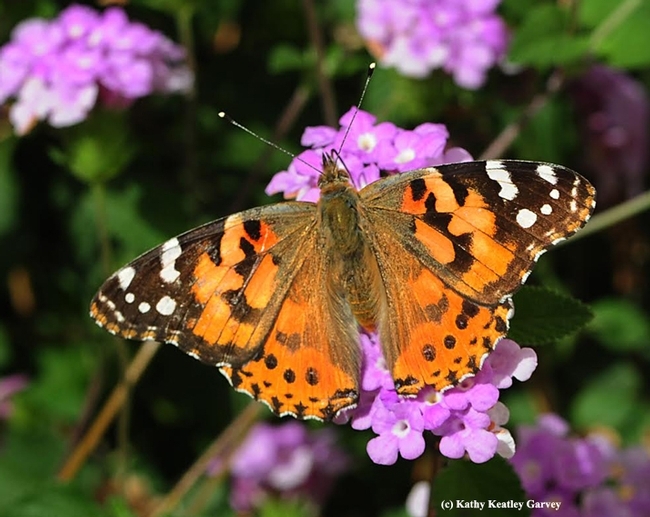 Butterfly expert Art Shapiro, distinguished professor of evolution and ecology, said that on Tuesday, March 17, St. Patrick's Day, "the front of a significant Painted Lady migration hit Davis about 7:30 this morning. I saw about 30 just in walking from Storer Hall to the Memorial Union bus terminal. Shapiro then went to Gates Canyon, Vacaville, one of his field study sites, and saw more. It was 77 degrees at Gates Canyon (sorry, Bostonians!). He saw PLs all the way. He counted 81 in the canyon "but the apparent density in the open--Pleasants Valley, Vacaville--was much higher, with about 6 per minute in my field of vision." "I imagine many were going over my head out of sight at Gates. Back in Davis I was seeing 10 per minute. This is about 1/6 of the density during the legendary 2005 migration." "They are ALL large, fresh-looking, and on a solid SE-NW course, as usual stopping for nothing and going up and over all obstacles; very few are nectaring. We'll see how long it lasts! The condition suggests these are the offspring of a first round of breeding somewhere in Southern California--not direct from the deserts. We have an exceptional crop of milk thistle (Silybum) this year. May their offspring eat it all!" You can read about the 2005 migration on Sharpiro's butterfly site. "This mass-migrant occurs in much of the Northern Hemisphere," he wrote. "Apparently the entire North American population winters near the US-Mexico border, breeding in the desert after the winter rains generate a crop of annual Malvaceous, Boraginaceous and Asteraceous hosts. The resulting butterflies migrate north." Painted Ladies on the move. Painted Ladies everywhere. And more on the way. Life is good! The painted ladies are on move. Scores of painted ladies (Vanessa cardui) are now migrating north from their overwintering sites near the U.S. Mexico border. 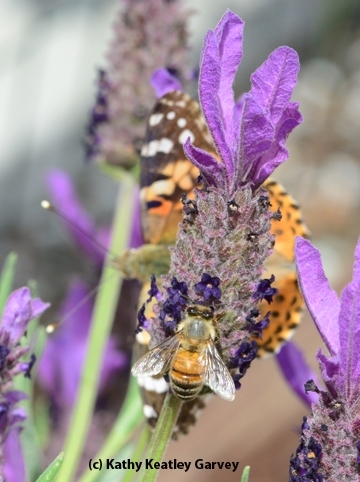 On Saturday, March 8 we saw two of them nectaring on Spanish lavender in the Avan Garden, a community garden at the corner of First and D Streets in Benicia. 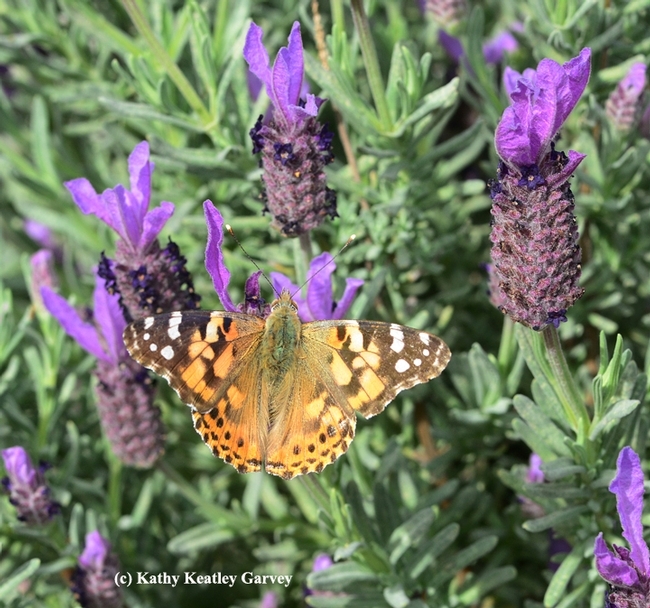 "Fascinatingly, they arrived in Prescott, Ariz., the same day (as the ones spotted in Benicia)," said butterfly expert Art Shapiro, distinguished professor of evolution and ecology at the University of California, Davis. "I think they're all from south of the border." The annual migration north varies, but can take place as early as late January and as late as mid-April. 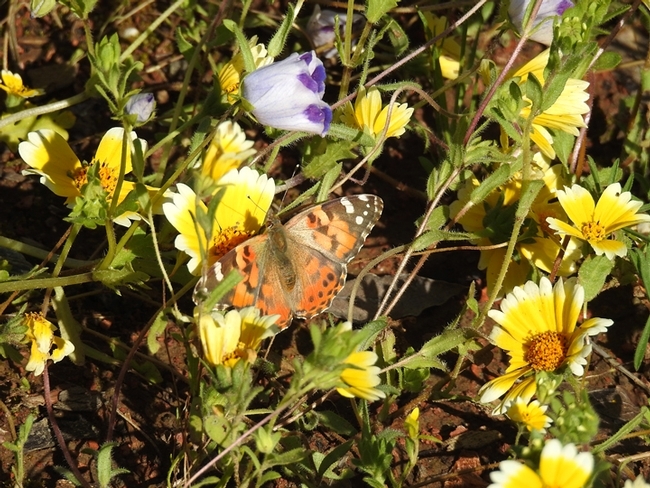 The painted ladies spend the winter in the desert, where in the late winter, they breed on desert annual plants, Shapiro says. The adults emerge in February or March and immediately migrate into the Central Valley and foothills, where they breed. 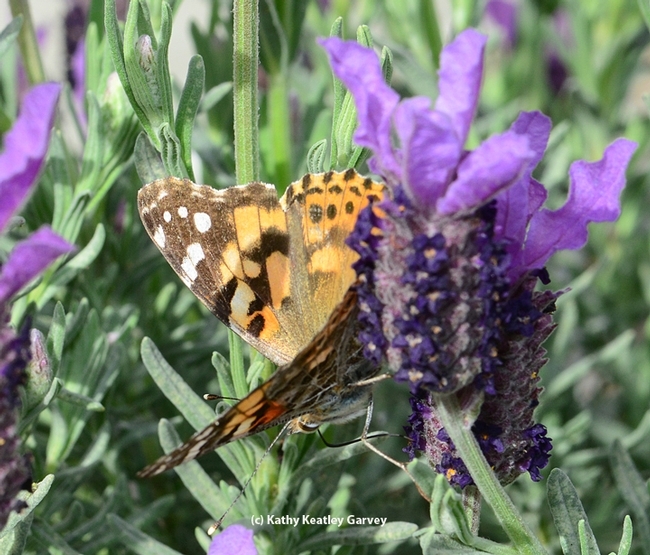 Around May, here in the Central Valley, you'll see the caterpillar offspring munching on borage, thistles, fiddleneck and mallows. Then the adults head toward the Pacific Northwest. "The painted lady moves northward in a generational wave as the season progresses," Shapiro says on his website. "Frequently it disappears altogether from the lowlands in summer. 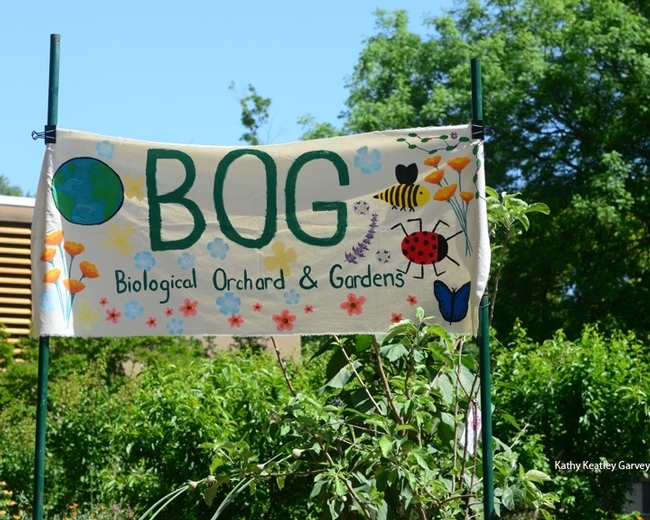 Beginning in August the movement reverses and butterflies head south toward the desert wintering grounds." "There is no evidence that this species overwinters successfully anywhere in our area, except for very rare individuals maturing in midwinter from really late autumnal larvae." The painted lady migration may not be as popular as the monarch (Danaus plexippus) migration, but it's fascinating just the same. 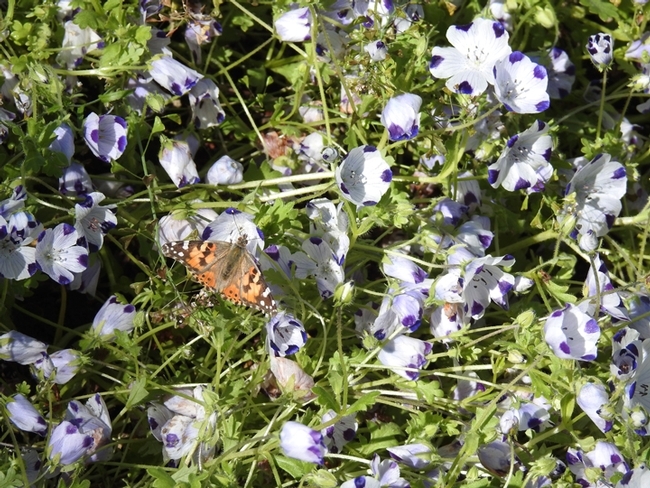 Shapiro, who has monitored the butterfly population of California's Central Valley for 42 years, will be speaking at noon on Monday, March 24 on "Ecological Communities and the March of Time" in the Commonwealth Club, 595 Market St., San Francisco. For program detail and registration, please see the club website. His talk is open to the public. For a discount, access the website and use the coupon code, "friendsforshapiro," said spokesperson Chisako Ress (chisakoress@gmail.com).